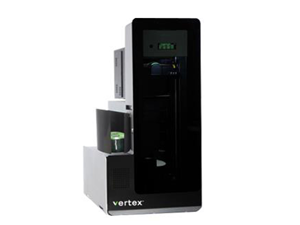 Vertex 22t-6 provides maximum performance, reliability, capacity and thermal print speed. The system consists of Vertex Server software, unlimited Vertex Client and Vertex IHE Media Importer licenses. Query & Build, Automated DICOM, and System Backup profiles are provided by default. Also included is a pre-configured built-in PC with monitor, Keyboard and mouse. DISC label design software and all necessary cabling are also provided. System Starter Package includes first year Advanced Exchange Maintenance, 200 pieces of Sorna-Certified white thermal hub-printable CD-R, one CMY color and one transfer ribbons, and 200 paper DISC holders. Large radiology departments with high volume CD and DVD production. Looking for CDs or DVDs?